The primary purpose of a wall is to hold the ceiling up, but they also get used for a lot of other things that vary depending on culture. Here in Houston we often use the walls in our homes and offices as blank canvases. Walls are also used for storage. Here and now, we store things on walls all the time with the help of hooks and shelves, but the ancient Maya took wall storage a step further. They stored stuff in their walls, and I don’t mean like a closet. The Maya stored offerings to their gods and even dead ancestors on the walls of their palaces, houses and temples. 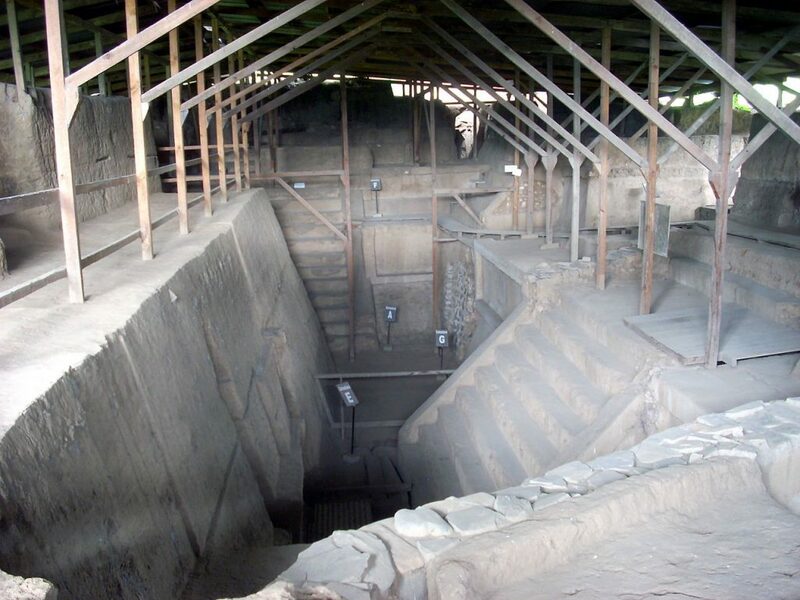 This excavation at the ancient site of Kaminaljuyu shows how palaces and temples were rebuilt and renovated over time, the previous structure being covered over by a new one. Often burials will be found interred within the older structure. Elite members of society were often buried within structures like this. Source: Wikimedia Commons. That’s right, there have been numerous bodies of sacrificial victims found within temple walls in Meso-America and even in small households people would often bury there deceased relatives under the floor of their house. Ancestors of the elite would often be interred within the walls of their palaces during periodic renovations to the structures. And it’s not just the Maya who did this, but cultures throughout the Americas had similar practices. Why would they do this? Well, pretty much for the came reason that some people in Houston nail horseshoes or crosses above their doorways. It’s all about spiritual energy. 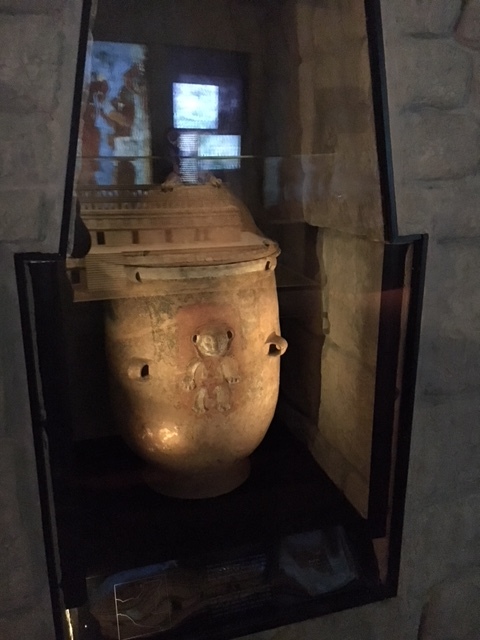 During some periods, Maya elite were cremated and their remains were placed in urns such as this one from our Hall of the Americas. In the case of the Maya, Aztec and some other sedentary cultures of the Americas the average person never left their village. They were born in the same house, or compound, that their father and grandfather were. They never left home, even after death. High ranking individuals in these societies may not have always been buried within their palaces, but they would at least be interred within various important structures in their home cities. Interestingly, when a new ruler conquered a city, one of the first things they would do is either destroy all memory of the family that ruled before them or marry in to that family. If they wanted to erase the previous dynasties memory, that meant destroying their monuments and sometimes even their burials. Either way, a physical, ancestral link to the land seems to be something that was greatly respected in indigenous american cultures, important enough that invading rulers feared their lack of it. Burials were often accompanied by offerings of jade bead or spodylus shell ornaments. Another important factor to consider is that the Maya venerated their ancestors. Offerings of food, jewelry, tools and weapons would be left at family shrines to supply deceased ancestors with what they would need in the next life. In return, ancestral spirits may put in a good word to the gods for you, or maybe bestow a particular undertaking with good fortune. So it was good to have these helpful ancestors as close to home as possible, and by that I mean literally in you home. Of course, as with any roommate this arrangement could be a double-edged sword because if you forget to leave offerings unhappy ancestors could make trouble. Burial within the walls of a house makes a lot of sense when you look at it from the perspective of the cultures that performed the act. 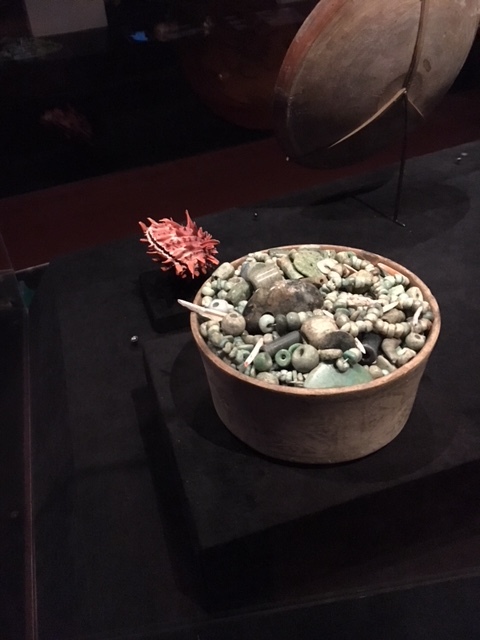 The objects displayed in our Hall of the Americas and other anthropologically-themed exhibits all have a fascinating story of a cultures unique solution to universal problem like how to store food, how to send messages, and even what to do with your dead relative. Come for yourself and see some of the other solutions that other cultures came up with.